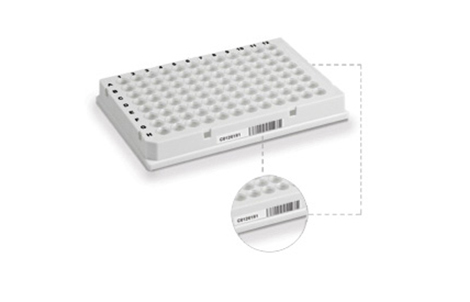 These PCR microplates have user- and machine-readable bar codes for sample tracking. Our barcoded PCR plates are compatible with Bio-Rad’s T100™, C1000 Touch™, and S1000™ Thermal Cyclers and all CFX series real-time PCR systems. Use the PCR Plastics Consumables Selector Tool to determine individual plate compatibility with other instruments. Several types of barcoded PCR plates are available to suit different needs. Hard-Shell® 96-Well PCR Plates have a patented* two-component design engineered to remain warp-free, permitting precise positioning for automation, and have black lettering for easy identification. Hard-Shell plates are compatible with heat, pressure, and adhesive sealing. Microseal® Low-Profile Skirted 96-Well PCR Plates are single-component polypropylene plates with locator holes and flat vertical sidewalls for secure handling. Raised rims provide compatibility with most sealing systems and a tight seal.